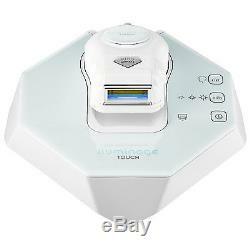 Iluminage Beauty Touch Elos At-Home Hair Removal System. 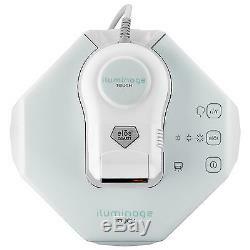 The only at-home professional hair removal technology clinically proven for all skin tones on the face and body. Powered by els technology, the iluminageTOUCH PERMANENT HAIR REDUCTION SYSTEM is the only FDA cleared technology for permanent results on all skin tones. Used by dermatologists around the world, it is clinically proven to be effective on the widest range of hair colors, even on blond, dark blond and red hair. 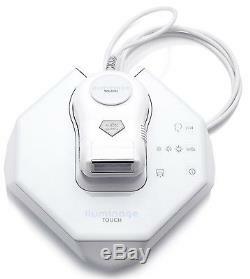 Use iluminageTOUCH on targeted areas once a week, for 7 treatments over a period of 6 weeks. Periodic touch-up treatments are suggested as needed. From the scientists at Syneron - the inventors of IPL and the breakthrough els professional technology - comes the first and only at-home technology to combine Intense Pulsed Light (IPL) and Radio Frequency (RF) energies to deliver clinically proven, permanent hair reduction. The combination of these two complimentary energies delivers unprecedented safety, speed and effectiveness for smooth, hair-free, beautiful skin - painlessly. 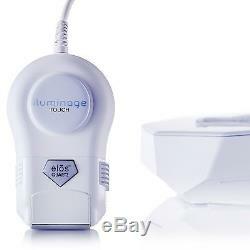 The iluminageTOUCH is an over the counter device intended for the removal of unwanted hair on men and women. It is also intended for permanent hair reduction in hair growth following an initial treatment regimen with or without maintenance when measured at 6, 9 and 12 months. An at-home hair removal device that uses breakthrough, patented Elos technology to deliver the effective removal of unwanted hair for all skin tones. Who is it for: The Touch is intended for use by women and men of all skin tones; can be used on body hair and facial hair below the cheek line (women only). Typically, it is used to remove hair on the arms, legs, underarms, bikini area, face, chest, back, and stomach. 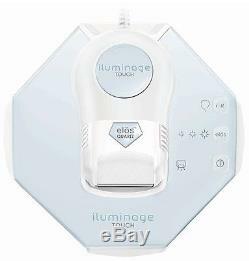 Why is it different: Iluminage Touch is an easy-to-use, at-home hair removal device that uses a breakthrough patented hair removal technology called Elos, a proprietary combination of IPL (Intense Pulsed Light) and RF (Radio Frequency) to deliver the effective removal of unwanted hair for all skin tones (I-VI). 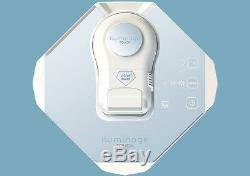 The Touch cartridge contains 120,000 pulses. How do I use it: 1. First, shave or wax the treatment area; do not apply moisturizers or oil to the skin before treatment. Press the power button on the base unit to turn the system on. Press the appropriate Elos level button (Low, Medium, or High) on the base unit to select the desired Elos energy. It is recommended to start with the Low level, and if you feel comfortable, raise the Elos level. Press the Elos activation button on the applicator. Do not press, just gently touch the skin. System will start emitting Elos pulses. Expect to see a pulse of bright white light from the IPL energy. Guide the applicator back and forth slowly and continuously on the treatment area without stopping in one place. 500K Pulses Quartz cartridge has enough pulses for up to 10 full body treatments. Measurements: Device 5"L x 3"W x 1-1/2"H; Cord 46"L.
Female Forearm: At 3 months, after 7 weekly treatments & 2 monthly maintenance treatments. Female Underarm: At 3 months, after 7 weekly treatments & 2 monthly maintenance treatments. Male Arm: At 3 months, after 7 weekly treatments & 2 monthly maintenance treatments. Male Leg: At 3 months, after 7 weekly treatments & 2 monthly maintenance treatments. Female Underarm: At 1 month, after 7 weekly treatments. Female Leg: At 3 months, after 7 weekly treatments & 2 monthly maintenance treatments. Permanent: The only FDA cleared technology for permanent results on all skin tones. Painless: Safe and effective with no nicks, stinging or snapping. Fast: Treats arms, legs, face, underarms and bikini area in just minutes. Powered by els technology, the iluminage TOUCH PERMANENT HAIR REDUCTION SYSTEM is the only FDA cleared technology for permanent results on all skin tones. 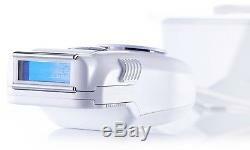 The item "New Iluminage Beauty Touch Elos At Home Hair Removal System 500,000 Pulses Bulb" is in sale since Wednesday, February 22, 2017.